SYNOPSIS: Dolores Gordon, who loves the stage, has always dreamed of stardom. But the only role she ever seems to land is that of the lowly understudy. So she decides the only way she is going to land the lead role in an upcoming community theatre production is to murder the lead actress, Guinevere Black. And that is exactly what she does. To make the murder more fun, Dolores hides Guinevere’s body in a large wooden trunk that is used as the centerpiece of the production’s murder-mystery set. But Dolores’ thrills soon turn to chills when she begins to observe strange things going on among the production’s suspicious and dysfunctional cast members. They seem to know something she doesn’t. Out of mere nervousness, Dolores decides to open the chest in an effort to make certain her victim hasn’t disappeared; that’s when her worst nightmare is realized: Guinevere’s body is indeed gone. But who took it? Which cast member is on to her horrific crime? And is that Guinevere herself peering through the French doors of the set when no one but Dolores is looking? Find out the answers when you read this murder-mystery comedy that spoofs Agatha Christie and Alfred Hitchcock all in one keep-you-guessing backstage comedy. "This play is appropriate for all ages. If you are looking for something that is melo-dramatic, this is the show for you. Each character has a hilarious back story that allows the audience and the actors someone to relate to. The play is well written, full of suspense and humor." 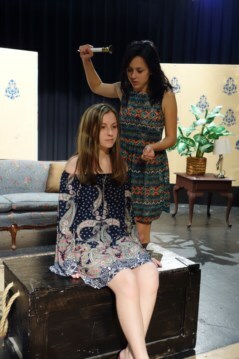 "This play was very fun for players and audience alike. we were very pleased with how this play turned out."